The natural gas market is undergoing a fundamental transformation. Industry has overtaken the power sector as the driving force behind the growing use of gas, thanks to rising demand in places like the People’s Republic of China, developing Asia, the Middle East and the United States. At the same time, structural changes in gas supply and trade are changing the global gas market. Heavily oversupplied markets, the ongoing shale-gas revolution in the United States, the second wave of additional liquefaction capacity from Australia and the US, and the fast-growing LNG trade are disrupting traditional gas business and pricing models. This is forcing market players to redefine their strategies and explore new markets. 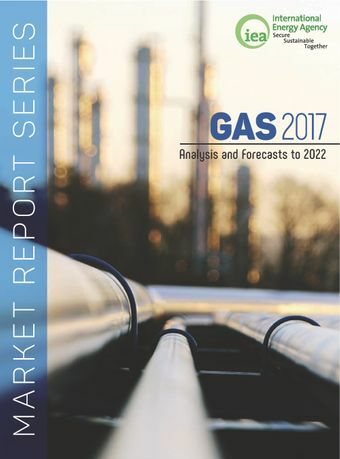 The IEA’s renamed Gas 2017 market report provides a detailed analysis of supply and trade developments, infrastructure investments, and demand-growth forecast through 2022. It assesses the main changes that will likely transform the gas market, led by rising demand in countries that include China, India, and Pakistan, thanks to ongoing economic growth and relatively low LNG prices. It also explores widening regional differences to traditional gas users, with flat demand forecast in Europe and structural demand decline in Japan. Oversupplied markets will also keep pressure on prices and discourages new upstream investment in gas production and LNG liquefaction capacity. At the same time, market reforms in places like Egypt, Brazil, Argentina and Mexico have the potential to bring new investments and technologies to unlock vast domestic resources, creating new prospects for the gas industry.